Other security technologies cannot protect against today’s wide range of content and connection-based threats well because they rely on general-purpose CPUs, causing a dangerous performance gap. Security Research — FortiGuard Labs have discovered over 170 unique zero-day vulnerabilities to date, totaling millions of automated signature updates monthly. Comprehensive Security — Control thousands of applications and stop more threats with NSS Labs Recommended IPS, sandboxing, VB100 certified antimalware and more. 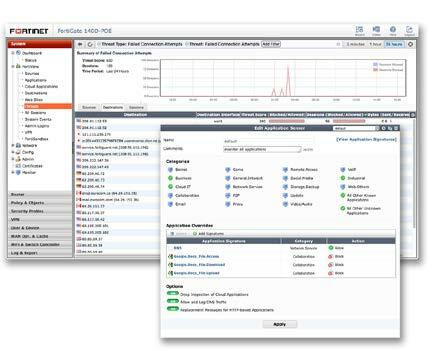 Superior Control and Visibility — Stay in control with rich visibility over network traffic, granular policy control, and intuitive, scalable security and network management. Robust Networking Capabilities — Optimize your network with extensive switching and routing, high availability, WAN optimization, embedded WiFi controller, and a range of virtual options. Comprehensive Support — For customers who need aroundthe- clock mission critical support, including advanced exchange hardware replacement. Premium Services — For global or regional customers who need an assigned Technical Account Manager, enhanced service level agreements, extended software support, priority escalation, on-site visits and more.